I'm so thrilled to welcome you to the first day of the Girl Friday Sews Blog Hop! Over the next two weeks, we'll be sharing tips and projects to use in all sorts of different work situations. I've gotten a few peeks at what the other bloggers are doing, and there's some great stuff coming up for you to see. Today is my day, so let's start by taking a look at where I work. This is my desk: a five foot square corner of the family room featuring an old round work table that I cover with a table cloth. My paper clips, rubber bands, and other office notions live in spice jars and a wooden rack from Ikea -- I love using unconventional objects for storage and display when I can. Most of my papers stay in wire mesh files from Target, and the colorful fabric bin on the left is from there as well. There are two calendars on the wall...yes, two. The one on the right gives me space to write the month's events, and the one on the left is just there because it's beautiful -- I couldn't resist Rifle Paper Co.'s "Cities" calendar this year (and if you can't resist it either, you can find it on sale for 50% off here). My inspiration file hangs on the wall along with my Focus mini quilt and Zakka Style message board. It all makes for a cozy, happy space where I can sit in the morning and read through at least a few of my blogs before the girls start school. 1. Use fabric instead of paper on any bulletin boards. The fabric lasts much longer without fading, and it looks so much warmer at the same time. Your choice of print will depend on your own style and what you'll be putting on the board, but I usually find that a small scale print works best. Also keep in mind the effects of color on your audience. My classroom was always more peaceful when all my boards were in different shades of blue and green. 2. Nothing warms up a room like pillows. Stack them in a reading corner -- kids love to snuggle up in a pile of pillows while they read -- or make a small decorative pillow to hang on a wall or door. They add a welcoming touch to an office chair as well. 3. Small touches can make an office seem so much more approachable. I brought my love of retro decor into my office when I was an assistant principal, including framed WWII era posters, an old fashioned coat stand, and a CD player built like a vintage radio. Add plants -- real or fake -- to your shelves, a table cloth to your conference table, and pictures or mini quilts to your walls. You'll be surprised by the difference it makes. I keep a Pinterest board full of ideas for this sort of thing which you can see here. 4. 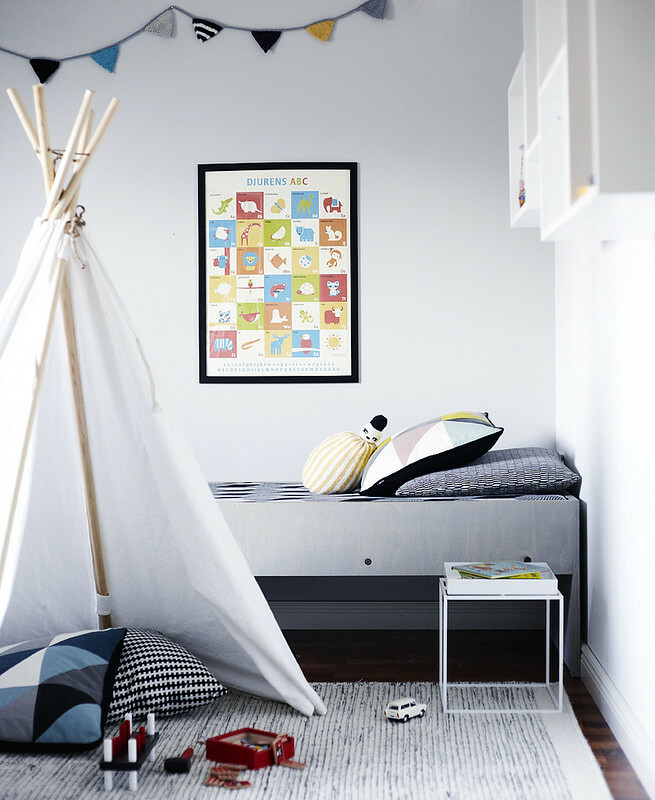 Set up a corner in your home where your children can read. It can be a simple as a pillow and a quilt next to a box of books. If you want to be more elaborate, though, find a theme that your child loves: princesses can read within the walls of a cardboard castle, pirates can cozy up inside an inflatable boat, and adventurous readers can camp out in a makeshift tent. There are tons of accessories that you can make or buy to complete the illusion. 5. Curtains aren't just for windows. Use them to cover bookshelves or cubbies, an open space under a sink or desk, or a closet without a door. You can hang them on either a length of heavy cord or a tension curtain rod. 6. Closets make gorgeous home offices. You can find examples all over the internet, including here. 7. There are a million and one uses for a zipper pouch in any workspace. They can hold pens and pencils, business cards, office supplies, flash cards, white board markers, bookmarks, clothespins, scissors, activity cards... The list is endless. So there are a few things to get you started. Now let's move on to the tutorial part of the post: how to make your own photo desk blotter. I love having a place for pictures and notes on my desktop (that photo, by the way, is from the day when my mom introduced me to my new baby sister), and it's great to be able to keep them in something that's handmade. This is a surprisingly quick project -- I spent more time cutting out the pieces than I did doing the actual sewing. The plastic portion is actually quilting template plastic, but if you have another source for this type of material, you could definitely alter the dimensions on your blotter to make it larger. 1. Fold the fabric for the blotter ends in half lengthwise and press. Slip in the batting pieces and sew 1/4" from the fold on both pieces. Position one hexagon strip 3/4" from the top edge on the left blotter end, just along the 1/4" seam by the fold, and sew 1/16-1/8" just inside the hexagon strip all the way around. Repeat with the other blotter end except position the hexagon strip 3/4" from the bottom edge. 2. Layer in this order (bottom to top): sew-in interfacing, top main body blotter fabric (right side up), mat end pieces (in place on either side with folded edges pointed toward center and raw edges matched up), bottom main body blotter fabric (right side down). Clip or pin them all together in a stack. 3. Sew 1/2" all the way around, leaving a gap for turning on the bottom edge in the space between the blotter ends. Trim the excess around the edges and corners and then turn the whole thing right side out, pushing out the corners with a chopstick. Fold the raw edges inside and press. Stitch 1/8" from the bottom and top edges on the main body piece only -- not on the blotter ends -- backstitching at both ends. Give it one last press, insert the template plastic, and you're done! If you're not into hexagons, you can make this project without them. This is the version that I made for Bunny's desk. The blotter ends are a little wider here -- 5.5 x 13" instead of 4 x 14. I personally prefer the more narrow ends, but it works either way. This one also has an extra layer of quilt batting in the main body piece for a softer, thicker feel. Love those elephants by Nancy Wolff! If you're absolutely crazy about hexagons, this is a version I made for my sister with wide ends and three rows of 1 inch hexagons. I had so much fun sewing all those little hexies! Feel free to adapt this tutorial to make it the way you want it -- there are always so many ways that you can tweak a project to suit your needs. If you make a desk blotter of your own, please share a picture with us in the Flickr group! Tomorrow Kristy has a fantastic pattern to show you, and yes, there may be paper piecing involved. She'll also have a wonderful giveaway from Pink Chalk Fabrics, so be sure to head over there on Tuesday to get in on the fun! Linking up to the Let's Get Acquainted Monday Link-up. In a word, March was wonderful. Spring came to visit our home with sunshine, fruit blossoms, and two heavenly weeks of vacation. It's always funny to me how I seem to have less sewing time when there's no school, but it's hard to find the time in between planting flowers, outings with the girls, and playing in the backyard. Still, I'm not empty handed this month, as you can see above: another fun Retro Kitchen block, my Tsuru bag, my Havana tutorial projects for Monaluna, my first Fabric Auditions post. If I had to pick a favorite, though, I'd definitely go with that Heather Ross quilt in the bottom right corner. I am amazed every day. The music video above explains it all better than I ever could. While I love the look of a fabric collection all by itself, I also love mixing prints together. It's the genius that I adore in projects by bloggers like Ayumi and Amy -- who incidentally had a brilliant post on just this topic recently. I agree with her that the most important factor in all of this is simply practice, so I've decided to add in a weekly post called Fabric Auditions. I'll pull a stack of fabrics from my stash and give it a name. That's it -- nothing fancy. Some of these may end up in a project, most probably won't, but it's the practice that counts. This one is called "Pineapple Upside Down Cake." I love those Geekly Chic glasses and the Comma prints. Black and white fabrics are really growing on me lately. This morning we went to visit my grandmother, and I brought her a quilt. She's accumulating quite a collection of Fabric Mutt originals -- every time she sees something new that she likes, she asks if I can make her a quilt just like it. 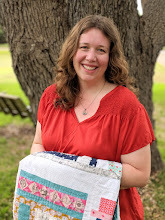 When she was asking for a new lap quilt last month, I showed her the Thimbleblossoms quilt patterns that had just been released, and she immediately went for Camille's Fireworks pattern. These blocks are not hard to put together, just a bit time consuming, but the final result is really beautiful. I used Splendor 1920 for the fabrics -- gorgeous prints. When I put the blocks together at the end, it was a little busy, so I added a grey stripe (for some reason it looks almost like a soft brown here) to break things up a bit. I don't remember what shade of Kona this is - I picked it up at my local quilt shop -- but I decided to use it for the binding too. Normally I hand sew the binding on my quilts, but lately I seem to be in a time crunch for so many projects that I've been attaching the binding entirely by machine more often. There's pluses and minuses to both techniques -- in fact, you can check out a great post about that topic here. The back is all one piece of Azure Decodence. I love the colors in this collection -- it all has such a great vintage look to it. There is so much detail in these designs, and I start to appreciate it even more as I work with the pieces of fabric to assemble the blocks. So last week Grandma got a look at the Heather Ross quilt that I made for the girls, and guess what she wants me to make for her next? That's right. Is this the best hobby in the world or what? One week left until Girl Friday Sews officially begins, and I thought I'd whet your appetite with an early tutorial for your very own Seat Stash pocket. When I was a teacher, I used to risk life and limb every day trying to walk down classroom aisles that were cluttered with all the books, folders, and papers that wouldn't fit in the kids' desks. Then one year our school ordered these incredible pockets that fit on the back of the student chairs. Not only did my life expectancy improve by at least five years, but my classroom aisles became clean overnight. I've been wanting to make one of these for Bear to use now that's she's doing her home schooling at a plastic Ikea desk and chair in the family room. We keep her supply kit on a chair next to her desk during school, but this pocket will be the perfect home for her worksheet folder. The Seat Stash is a snap to make -- you can easily whip up one in less than an hour. The measurements in my tutorial will fit a 16" wide chair back, but you can adapt this by measuring the width of your chair and adding two inches to the number you get. All of my fabrics for this project are from Once Upon a Time by Alexander Henry -- perfect girly bliss for my little Bear. 2. Make the main body pieces for the pocket. Take an interior and exterior piece, right sides together, and sew 1/4" from one 18" end. Fold one piece back so that the wrong sides are together and the edges match up. Press and then top stitch 1/4" from the fold. Repeat with the other pieces EXCEPT add the pocket in there on top of the exterior piece with the bottom raw edges of the pocket lined up with the other two pieces. Again, check your direction on the pocket before you sew these together! 3. Assemble your pocket. Place the two panels on top of each, interior pieces facing each other with the pocket on the bottom. Hold them together with pins or clips. Sew 1/4" from the edge around the sides and top, leaving the bottom open and back stitching at both ends. Trim the corners and turn the piece inside out, pushing out the corners with a chopstick. Press. Sew 1/2" from the edge around the sides and top this time, again back stitching at both ends. Turn the pocket right side out, pushing out the corners with a chopstick. Give it a good press all over and fit it onto your chair. It's ready to go! I love a project that's easy to make but incredibly useful at the same time, so this really works for me. I also think a patchwork version of this would be adorable, and one of those may soon be in my future since Bunny gave me quite the "how-could-you-make-one-of-these-for-my-sister-and-not-for-me-if-you-really-loved-me" look when she saw Bear joyfully parading her well dressed chair around the house this afternoon. If you make a Seat Stash, please share pictures with us in the Girl Friday Sews Flickr group which you can find here. We'd love to see what you're making! Linking up with the Let's Get Acquainted Monday Link-up. I started work today on a new quilt. It's a miniature version of Camille's lovely Fireworks pattern which will consist of just four blocks made with Splendor 1920. I'm already liking it a lot. Jennifer posted the second Havana tutorial today: the Scooter Bag. It's a soft, cuddly monster of a bag that will carry just about anything you want to bring along. Check out the tutorial here. And finally, I'm hopping onto the Bloglovin' bandwagon, though it's tough to let go of my Google Reader. Real tough. The Bloglovin' people have a lovely website, I'm just such a creature of habit that little changes throw me for a loop. If you'd like to help me through my readjustment period by following me over there, I'd be quite the happy clam. Swing by here on Monday -- I'll have a pre-blog hop tutorial to share with you for Girl Friday Sews! 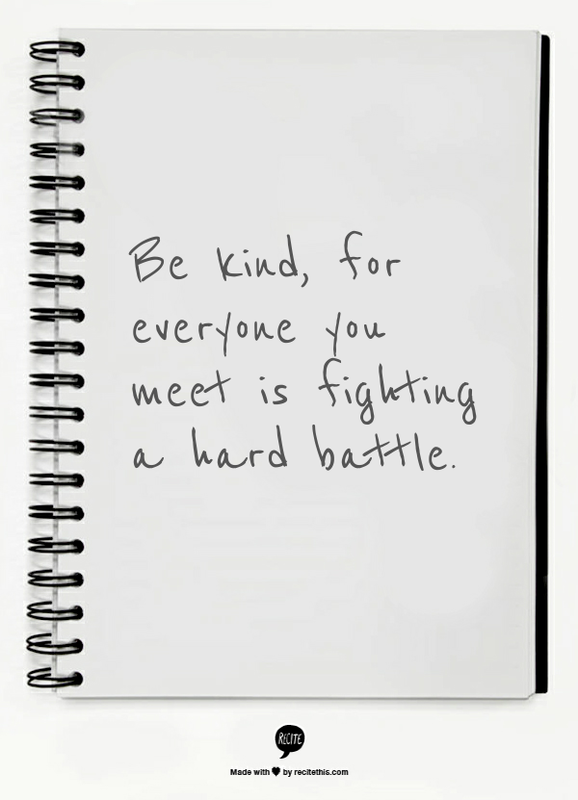 I've seen some unbelievably painful situations play out in the lives of friends over the past few months: illnesses, debilitating job searches, family conflict, the loss of precious loved ones. Some people want to talk about it and others don't, but they're all doing their best to put one foot in front of the other each day. It's impossible for us to know the heartbreak that may be happening in the life of the person on the other side of the phone, the computer screen, the store counter. And since we don't know, it doesn't hurt to be a little more patient -- even if we're dealing with struggles ourselves. This little saying has lived on our refrigerator at home for the past year, and I can honestly say that it's done me good to have that reminder in front of my eyes when I'm tempted to lose it with any number of different people. It really is a better way to live. My husband is off teaching and on spring break for the next two weeks, and I couldn't be happier. It's possible that the best part of the whole deal is that I get to sleep in every morning, and he gets a nap every afternoon. This morning when I finally came downstairs and clicked on my laptop over breakfast, there were some lovely things to see online. My Tsuru bag made the Cloud 9 Fabrics Facebook page today -- you can check it out here. I was thrilled when Michelle asked me to send her the picture for this. Tomorrow, the first of three tutorials I created with Monaluna's adorable Havana collection will be popping up on Jennifer's official blog. I had so much fun working with these darling fabrics to create my Scooter Pack -- a set that includes a bag, a reading mat, and a pillow. Jennifer is such a lovely person and an incredibly talented designer. Have you seen her latest Modern Home collection? Those llamas are cuteness itself, and I love the herringbone and leaf prints too. Be sure to check it out! Taryn has an absolutely fabulous post up today about the Girl Friday Sews Blog Hop, full of wonderful tips and tricks for organizing your workspace. She's also holding a giveaway for a $25 Pink Chalk Fabrics gift card (who can't use one of those? ), but really you need to head over there just to see her adorable new mouse pad. Melody Miller goes with everything! The day is calling -- and maybe a little sewing, too? -- so I'm off. Have a great Monday! and smelling these. Heaven on earth, my friends. LizDandelionD wins the Craftsy class from this week's giveaway. I've sent you an email, Liz! 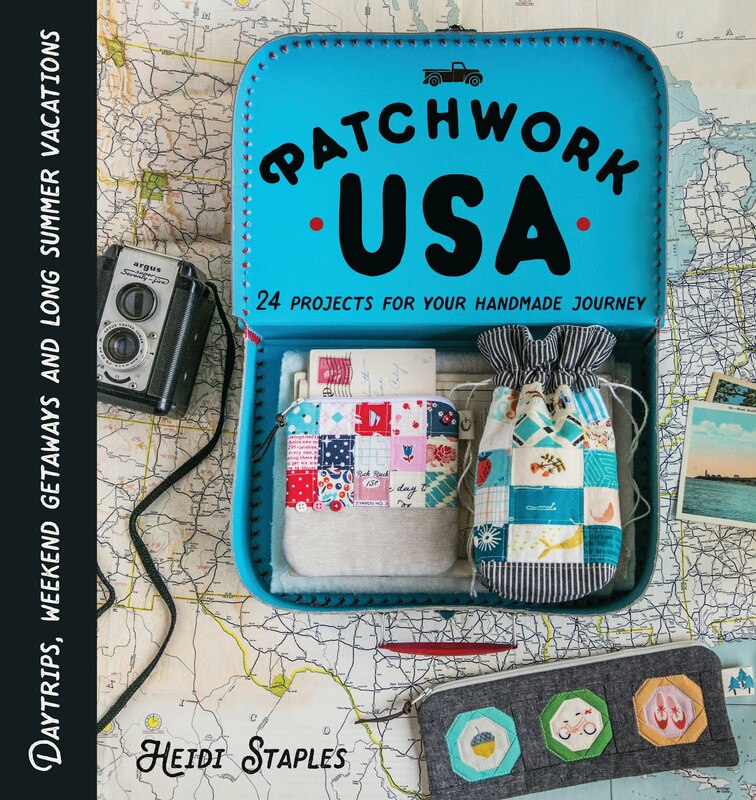 My very talented friend Taryn at From Pixels to Patchwork will be guest hosting our giveaway next week, so be sure to stop by her blog on Monday to get in on the fun. She loves office supplies almost as much as I do -- maybe even more -- and I know she'll have lots of great stuff to share. See you then! After a more than a year of collecting fabric and just over a month of sewing, my Heather Ross quilt is finally done. I love this quilt dearly, though there were times when I wasn't sure it was meant to be. I've never taken such an improvisational turn at quilting before, and though it was way out of my comfort zone, I'm not one bit sorry that I took the trip. I'm calling this one "Once Upon a Time." Making a quilt this way is crazy. I wasn't even sure where to begin. After thinking and sketching and thinking some more, I finally decided to start by making some blocks that I loved and then building around those. I looked at my favorites on Flickr and Pinterest and pulled out a few that I liked: the wonky star, the postage stamp, the winged square nine patch (favorite block of all time -- I can't wait to make another one of these). But putting them together was difficult. I wanted things to look a little more random than your basic sampler quilt. I also realized that I was going to need more than only Heather Ross fabrics, so I pulled some extra prints that coordinated. A definite color scheme began to emerge, and I had to rip out some things that didn't go, add some things to balance what stayed behind. I spent one evening just picking up fabric sections and moving them around over and over again. Panic hit me when I began to fear that this was all a mistake. Half of me wanted to rip it all apart and admit defeat, but I just couldn't give it up. But, oh my goodness, that moment when I started to like it -- when I started to love it. It was worth every hour of angst that came before. As I began sewing the different sections together, it came alive for me, and suddenly I loved the challenge and excitement of seeing what was going to happen next with this quilt. I had intended to hand quilt this piece, and I even spent about two hours on that, but in the end it just wasn't working for me. I ripped out all the hand stitches (even though it about killed me to do it) and did it all by machine. Again, I'm learning: if you don't like it, don't leave it that way -- even if it means taking apart something you've poured a lot of time into. You'll hate what you don't like every time you look at it, so you might as well start over and do it right. I'll be perfectly honest, the back is nothing fancy. This quilt is going to be hanging on the wall in Bunny and Bear's room, so no one's going to be looking at that side. Just in case it ever comes down, though, I picked out some pretty fabrics for the back. And there you have it: so many lessons wrapped up in one little quilt. It somehow seems fitting that I'm passing this one on to my daughters. They're still growing up so much every day, and strangely enough, I am too. It feels good to know that challenges -- even little ones...even sewing ones -- don't have to beat us if we don't let them. Today you'll find me over on the Pink Castle Fabrics Blog as a guest blogger for their Spring Cleaning Series. I thoroughly enjoyed writing this post about different ways to capture inspiration for your sewing projects. I'd love to hear your thoughts on the topic too, so be sure to come back and share any ideas. Happy Wednesday! Kristy has another set of Retro Kitchen blocks almost ready to go, and they're just as fabulous as her first round. I got to test out the scale...so much fun. Paper piecing isn't everyone's cup of tea, but for me, it's therapy. I love working on these. 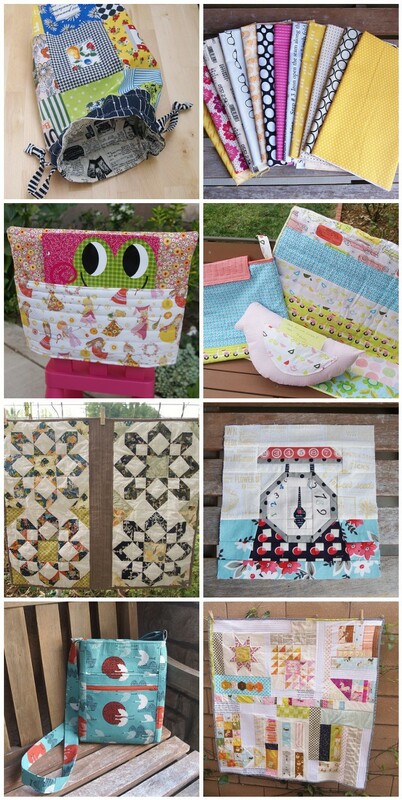 If you haven't yet, check out my Craftsy class giveaway here. Linking up to Fabric Tuesday at Quilt Story.